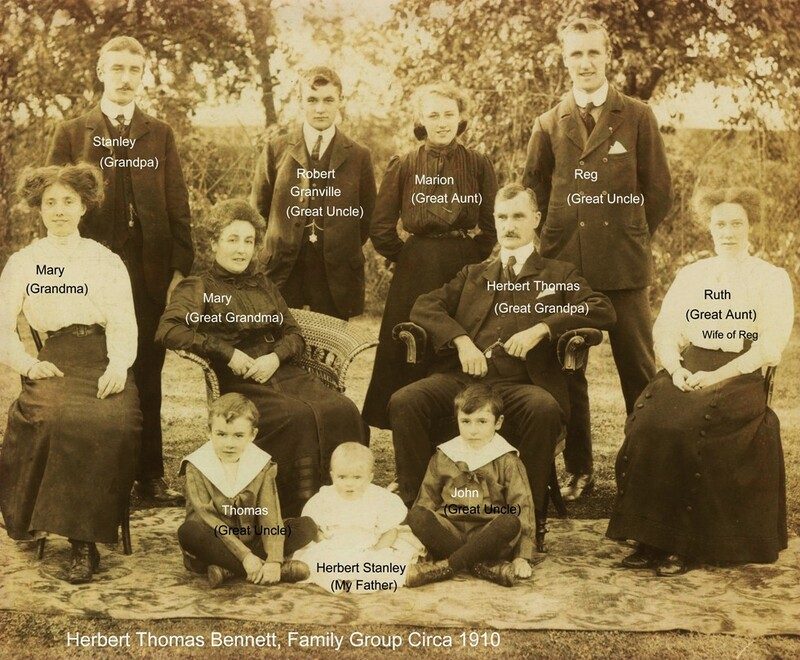 Robert Granville Bennett was the third son of Herbert Thomas Bennett, a Farmer, and his wife Mary (nee Taylor). The family were moderately wealthy, as Herbert was the son of John Bennett who established and was Chairman of the Bennett Steamship Company of Goole, which by 1899 had six ships operating between, Goole, London and Boulogne. Herbert and his son were both keen golfers and members of the nearby Rawcliffe Park Golf Club which was formed in 1900. There are many newspaper reports showing the results of matches they played, including one in 1910 reporting that Granville Bennett (the name he was going by) had, at the age of 16, won a competition called 'The Ward Cup'. However, his name is absent from results published after February 1912, which could indicate that he had left the area. Some of the obituaries say that he was pursuing a profession in farming. William Hibbert Marshall of Patterdale Hall, who owned very large estates in Cumberland, Westmorland and Yorkshire was born at Enholme Hall near Patrington, east of Hull, and other members of the Marshall family still lived in the area. The Bennetts and Marshalls may well have had similar social circles (such as golf, the Chamber of Commerce, etc), so it is possible that he was invited to spend time as a guest at Patterdale Hall to study farming on the Marshall's estates. There was also another ‘Herbert Bennett’ from Ambleside who is listed as a landowner in the 1915 Electoral Roll. He had no children and it is possible that Robert was a cousin looking after the land. 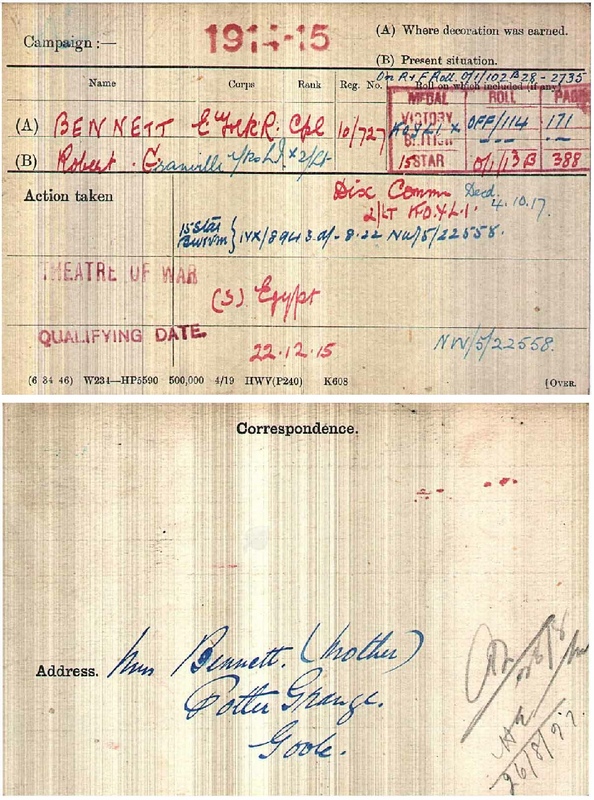 This has yet to be proved but it is a fact that the only Bennett we can find with a forename of Granville, who enlisted in the East Yorkshire Regiment before Jan 1915 and who died during WW1 is Robert Granville Bennett. Granville enlisted on the 1st September 1914 as a Private into the 10th Battalion of the East Yorkshire Regiment (a Pals Battalion known initially as the Hull Commercials)1. The photo shows the Hull Commercials being trained in November 1914, before they moved to Hornsea on the East Coast and were issued with proper khaki uniforms to replace their armbands (making them into real soldiers) rather than the disliked blue 'Post Office' style uniforms that many of Kitchener's New Armies had to wear at first. After several months training the 10th Battalion, as part of the 92nd Brigade, moved to Ripon in the Spring of 1915 for intensive Brigade training, such as tactical schemes and night operations. On the 28th October 1915, highly trained and now part of the 31st Division, the Battalion travelled by rail to Salisbury Plain for Divisional level training. On the 14th December, the 92nd Brigade proceeded to Devonport by rail and embarked aboard the S. S. 'Minnewaska' bound for Egypt. The Brigade disembarked at Port Said on the 22nd December (just in time to qualify for the 1915 Star) where patrol and guard duties along the banks of the Suez Canal, and much digging in the sand, occupied the troops of the 31st Division for several weeks. Then orders were received for the 31st Division to move to France - the 10th Battalion left Port Said on the 29th February 1916 on board H.M.T. Tunisian and arrived in Marseilles on the 7th March, from where they headed north to the Somme, which was a comparatively quiet part of the front line at that time. However, they were there for a reason - during the winter of 1915-16, the Somme Battles of 1916 had been planned and agreed upon by all of the Allies. Granville's Battalion took part in the opening Battle of the Somme, the Battle of Albert (1st - 13th July 1916) and, during the next ten months, fought in other notable actions, such as the Battle of the Ancre (13th - 18th November 1916) and the Third Battle of the Scarpe (3rd - 5th May 1917). 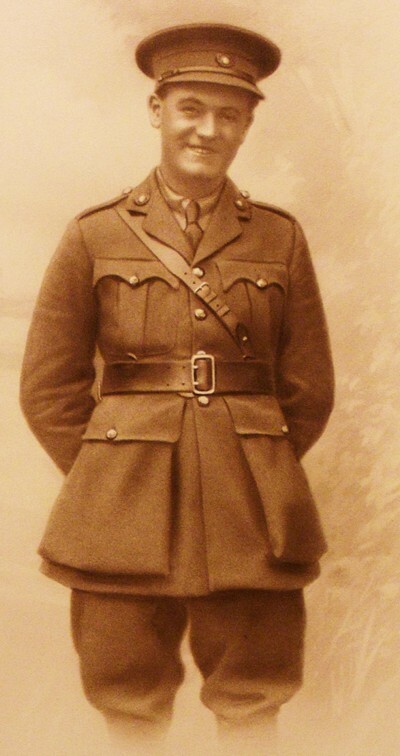 Granville had been progressively promoted and by early 1917 he had achieved the rank of Sergeant. His leadership skills and other abilities must have been recognised, as, on the 29th May 1917, he was discharged from the East Yorkshire Regiment and commissioned the following day as a Second- Lieutenant with the Kings Own Yorkshire Light Infantry (KOYLI). Presumably after some Officer training, perhaps in England with some home leave, 2nd Lieutenant Bennett reported to the 9th Bn. KOYLI on the 21st July 1917. They were holding positions close to the Hindenberg Line at Longpre, north-west of Amiens. On the 24th July, the Battalion was relieved and moved away from the front to Moyenneville for a week of recuperation and training, before moving 60 miles north-east to Croisilles, just south of Arras. After spending a month there, on the front line, they enjoyed another break of over two weeks at a camp in Simencourt, just west of Arras, where they received more training (and the occasional football match). During the latter half of September the Battalion moved gradually northwards to take up a position on the front line near Polygon Wood, east of Ypres in preparation for their part in the Battle of Broodseinde, a major offensive by the British Second and Fifth armies against the German Fourth Army. Just a last wish for you to do in case of a serious accident to me which may occur during my vacation on the continent or elsewhere. Tis a beautiful day when this I write. Will you see that my suit-case and all it's present contents are given to Edie Blyth, she has the key so you need not break it open. All the remainder of my silver, gold etc keep yourself. All money matters are fully booked up in my little ledger and of course you are to take all that remains. Tell every one that it is my sincere wish that not 1/16 of an ounce of black is worn, unnecessary expense and money is scarce. Edie Blyth is believed to be Edith Alice Blyth who was born in Goole around late 1892, a similar age to Granville so possibly his fiancée. Edie was the daughter of Arthur Blyth, a Draper, and his wife Martha Jane. When we were kindly sent the photos of Granville above and below by his great nephew these seem to confirm that Edie was his fiancee as the photo is signed “in affectionate remembrance” by the Blyth family, including Edie. 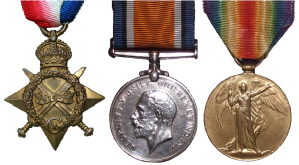 Granville had served for just over three years and his medal card shows that he was posthumously awarded the Victory Medal, the British War Medal and the 1915 Star. 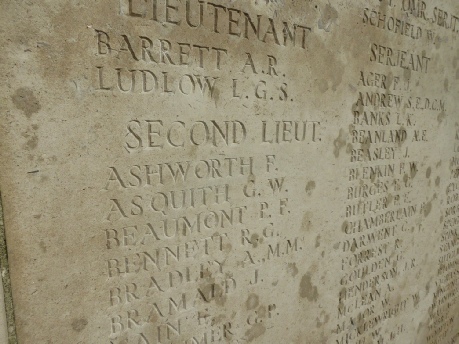 Granville is remembered on the Patterdale War Memorial, the Cenotaph in Goole, Yorkshire and on the Tyne Cot Memorial. 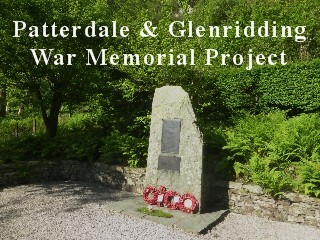 His name is not included on the Glenridding Village Hall Roll of Honour, probably because his connection with the Dale was not as strong as some others. What became of Granville's family? His father Herbert Thomas Bennett was born in Adlingfleet, Yorkshire around 1864. He married Mary Taylor around August 1885 (Mary was born in Liverpool around 1864). They had six children. At the time of the 1911 Census, Herbert was described as a Potato Merchant and a Farmer, and was a member of the Goole Chamber of Commerce. He went on to become a Director of the Goole Steamship Company and Chairman of the Bennett Steamship Co. in Goole, which had been founded by his father John Bennett. Herbert died on the 1st September 1941 at his home 'Hafodty', Loughborough Road, Ruddington in Nottinghamshire aged 77, and Mary around August 1945 aged 81. His oldest brother Stanley Bennett was born in Swinefleet, Yorkshire on the 1 July 1886 and died there around August 1957 aged 71. He married Mary Prentice in Goole around February 1909. His older brother Herbert Reginald Bennett was born in Swinefleet, Yorkshire around May 1888. He married the wonderfully named Olive Tree in Goole around May 1911. Sadly, Olive died at the early age of 42 in Feb 1931 and Herbert married again, to Ruth B Haynes about Aug 1932. Herbert died in Goole about Nov 1952. His younger sister Marion Bennett, to whom Robert bequeathed his effects in his will, was born in Swinefleet, Yorkshire on the 20 July 1895. She married Clwyd Abbey. Marion died on the 18 Mar 1972. The twins, younger brothers Herbert Thomas Bennett and John Taylor Bennett, were born in Goole, Yorkshire around 1905. John was also a keen golfer - he married Hilda Goodworth 3 Sep 1931 at Goole Wesleyan Church. We are incredibly grateful to Steven, Granville’s Great Great Nephew who provided the photos of Granville and his family. We will continue to investigate in the hope of finding out some more details, but in the meantime if you have any information that could help please contact us. In February 2018 we made a trip to Flanders in Belgium including a visit to the Tyne Cot Memorial to find the inscription to Granville on the Tyne Cot Memorial to the Missing, which list the names of the 34,984 missing men who died after 15 August 1917 on the Ypres Salient. 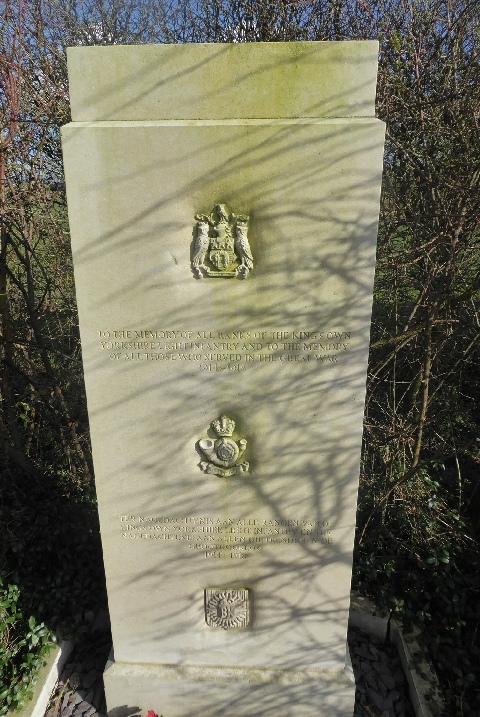 This is shown below along with a photo of the memorial stone at the entrance to Tyne Cot in memory of all the men from the Kings Own Yorkshire Light Infantry who served in the Great War. The very first person on the memorial, G R Bennett, has long been a mystery to those researching the memorial names and puzzled us for several months. 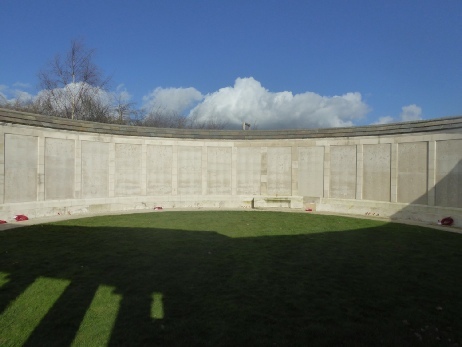 However, a breakthrough came in March 2015, when a list was found, compiled in early January 1915 by Mrs Marshall of Patterdale Hall, that named him as Private Grenville Bennett, who had enlisted in the East Yorkshire Regiment. Although the person described here is the most probable we have found, we have yet to find evidence that he was actually in Patterdale before the war and therefore still cannot be 100% certain. More details on the great research undertaken by Norman Jackson can be found here. Born 9 August 1893, Swinefleet, Yorkshire. Died 4 October 1917, Beselare, Flanders (Age 24). 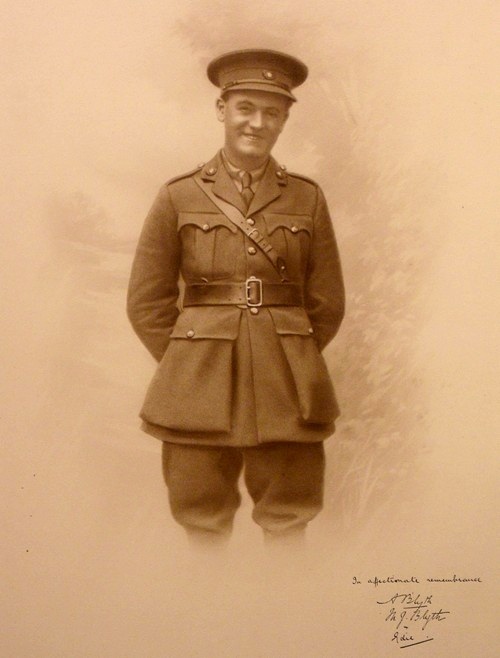 Granville in his uniform - the photo is signed by Mrs & Mrs Blyth and Edie and was kindly provided by Granville’s Great Great Nephew. 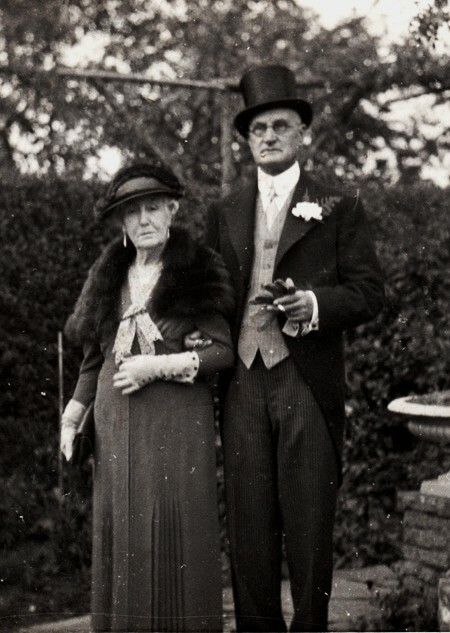 Granville’s parents on their golden wedding anniversary. This was also kindly provided by Granville’s Great Great Nephew, along with the wonderful family photo below from around 1910.